On January 15, 1865, after over two days of relentless assaults from Union gunboats followed by a land attack of 3,000 troops, the Confederacy surrendered Fort Fisher, the only remaining protection for Confederate blockade runners. Early in the war the Confederacy built the earthen Fort Fisher in a strategic location near the mouth of North Carolina's Cape Fear River, which ensured that the port of Wilmington remained open. The fort soon became the primary defense for the Wilmington supply line—the central artery bringing food and munitions to Robert E. Lee's Army of Northern Virginia. 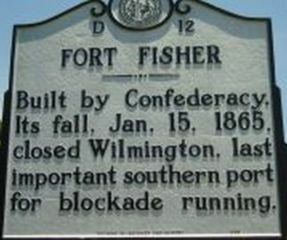 After Fort Fisher's surrender, Union troops advanced to take Wilmington, and the supply line was irrevocably compromised, thus cutting off the lifeblood of the Confederate military effort. When Fort Fisher fell, people throughout the Confederate States realized the devastating effects it would have on the Confederacy's future. Fort Fisher's fall left the Confederacy more vulnerable, especially to the advancing march of General William Tecumseh Sherman's troops, which was greatly feared. In Chapel Hill, North Carolina, Cornelia Phillips Spencer (1825-1908) wrote of the fear she and others felt upon the fall of the fort and the subsequent fall of Wilmington. In Chapter Two of her narrative, The Last Ninety Days of the War in North Carolina, Spencer writes: "What the fate of our pleasant towns and villages and of our isolated farmhouses would be, we could easily read by the light of the blazing roof-trees that lit up the path of the advancing army. General Sherman's principles were well known […] and had been thoroughly put in practice by him in his further progress since. To shorten the war by increasing its severity: this was his plan—simple, and no doubt to a certain extent effective" (p. 31). In Columbia, South Carolina, seventeen-year-old Emma Florence LeConte (1847-1942) recorded similar sentiments in the January 18th entry of her diary: "One piece of bad news is certain, namely that Fort Fisher has fallen at last. I had expected to take great interest in the Soldier's Bazaar, but I cannot. It seems like the dance of Death, and who can tell that Sherman may not get the money that was made instead of our sick soldiers. How long before our beautiful little city may be sacked and laid in ashes. Dear Columbia, with its lovely trees and gardens. It is heart-sickening to think of it." Just one month later, LeConte details Sherman's march through Columbia.